Re: Your Favorite MLP Song? G1: Dancing on Air, Pony Magic (it's fun!) ... Oh! and just about everything from Magic Coins since it's my favourite episode. A mother pony can be protective of her young just like dogs. Who wants to changed this sig into ponies? The themes from Rescue at Midnight Castle and Escape from Catrina are my very favorites. After that, I have too many to list. What exactly does this machine do? I think Let the Bell of Freedom Ring is probably my favourite G1 song, but honestly I love so many of the G1 songs: Call Upon the Seaponies, Dancing on Air, A Little Piece of Rainbow, Those Good Old Days, Dressed Like a Dream, Let's Not Take a Nap, Oh for a Rainy Day, Where Have the Unicorns Gone, What Do You Give to a Troll....the list goes on. G1 - I am kind of loyal to the song tape, because it was so prominent to my childhood. I also love the US story tape song "Picnic at the Paradise Estate", it sticks in my head for some reason. From the G1 show - which I wasn't a huge fan of - I like a few of the songs. But the ones from my childhood that stick are from Revolt of PE. "Remember the time when the ponies were here..." etc. G3 - That's what I love about Christmas. That's the only G3 song I remember well and I like it a lot. G4 - I have only seen about 2 seasons of FIM but I can't remember a single song from the show that stuck with me :/ They all seem a bit tacky and trying too hard. I do like some of the EQG songs - particularly those from the Dazzlings in Rainbow Rocks...I kind of have a Misfit vs Jem feeling about them, in that the villain songs are way better than the one that ultimately "wins" because the one that wins has to spend its lyrics preaching the moral and thus doesn't make for a great song. I also like the song SciTwi sings at the start of Friendship Games. I like the 1 2 3 Its Cherries Jubilee song. "Raise this barn, Raise this barn, 1,2,3,4/Together we can raise this barn, 1,2,3,4. I really enjoy Raise This Barn also. Thank you SDS for my avatar and sig. Oh, so many I love! I don't think I can choose just one, honestly. "What Good Will Wishing Do? ", "I'll Go It Alone", "Bright Lights", "Dancing On Air", "We're Gonna Make You Sorry", "Babysitting", "A Little Piece of Rainbow","Dressed Like A Dream", "Those Newborn Twins", "Home", "Nothing Can Stop the Smooze", "Oh, For a Rainy Day", "Evil Witch Like Me", "Let's Not Take a Nap", "By Right I Should Be Queen", "There's Always Another Rainbow", "Call Upon the Sea Ponies"... I love them all! For me it's no contest. The opening theme from Rescue at Midnight Castle and Call Upon The Sea Ponies! I love those two song so much, and they're so nostalgic for me. 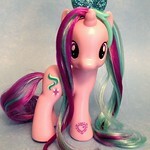 Although I like all the songs from Rescue at Midnight Castle and the My Little Pony Movie. My boyfriend even said he liked Call Upon The Sea Ponies when I made him listen to those two songs once. Shoo be do, shoo shoo be do! From FiM I've always liked May the Best Pet Win, as well as The Flim Flam Cider song, and Bats, too. I'm not a big Christmas fan, but "That’s What I like about Christmas" could almost convert me... and now it is stuck in my head. "Time to be Awesome" I just LOVE Zoe Saldana's voice in this song! I wish she would do more musicals! "Welcome to the show" , "Shake your tail" and "Awesome as I wanna be"
I don't know the G1 2 or 3 songs that well, But I do know that the Sea ponies song ALWAYS gets stuck in my head when i see/hear "Shoo Be Doo"
Nothing can stop the smooze!